Elections for Portland Mayor and Commissioner are happening May 17, 2016. The Buckman Community Association is holding election forums to encourage dialog between residents and candidates. These forums have been very successful in the past. All candidates who have filed for office have been invited to participate. The Commissioner Candidate Forum is Thursday, March 10, 7 pm–9 pm. The Mayoral Candidate Forum is Thursday, April 14, 7 pm–9 pm. Both forums will be held in the Commissioners Board Room of the Multnomah County Building, 501 SE Hawthorne Blvd. Refreshments will be provided. This is a free event and is open to the public. *Questions from the audience: each candidate will have the opportunity to answer the questions. No questions will be directed at a specific candidate. A presenter from Eastside Village, PDX will be on hand at the June 12th BCA meeting. Bill Bond, LCSW, GCM will talk about the non-profit, predominantly volunteer, aging in place village forming in SE Portland that will begin to offer services in early 2015. A “village” is a group of like-minded people in a geographic area who come together to figure out and develop the resources they will need to age comfortably in their own homes. The Eastside Village PDX service area will cover all or part of these 12 neighborhoods: Buckman, Kerns, Laurelhurst, Sunnyside, North Tabor, Montavilla, Hazelwood (west of 122nd), Hosford-Abernethy, Richmond, Mt Tabor, Mill Park and South Tabor. Come join us to find out more about this exciting movement and its opportunities: www.eastsidevillage.org or attend the next Buckman Community Association meeting, June 12, 7–9 PM, Multnomah County Board Room, 501 SE Hawthorne Blvd. This Thursday, October 18th, a Buckman Community Association Land Use Meeting will be held to discuss proposed development at 2607/2625 SE Hawthorne Blvd. The meeting will be in the Multnomah County Board Room, 501 SE Hawthorne Blvd., 7-8:30pm. These two magnificent and grand 106 year-old historic houses were purchased at the end of last month. The new owners plan to build a 4-story, 77-unit apartment building where these homes (currently full of commercial tenants) now lie. Here is what they currently look like. The tenants were unaware the property was being sold and were all given immediate 30-day eviction notices. The former owner, who has held these properties for decades, has said he feels sick about the plans to tear them down and did not know this was planned. These properties are now in real danger of being demolished imminently to make way for this new, large development.. The developer, Aaron Jones, and SERA Principle Architect Kurt Schultz have been invited to the meeting so they can hear concerns about this proposal, and give information to community members. Concerned members of the community are asked to attend. Ideas, suggestions and proposed solutions to save these important properties are welcome and wanted! If you are unable to attend, but are interested in saving the buildings, please contact myself and/or Tim Askin, BCA Secretary and Co-Land Use Chair (tim.askin@gmail.com). You can also contact the entire BCA Board anytime at buckmanboard@googlegroups.com. BCA seeking new board members! We wanted to let everyone know that the Buckman Community Association will be holding board elections at the June 14th monthly meeting. The BCA is the registered neighborhood association for the area bounded by SE 28th, E Burnside, SE Hawthorne Blvd., and the Willamette River. The BCA is involved in many ongoing projects, including our annual and always fun Picnic in the Park, to be held this year on Sunday, August 5th in Colonel Summers Park. We also are engaged in ongoing sustainability projects, land use reviews, transportation and safety issues, historic preservation, getting a community center built, and helping neighbors connect with and get results at City Hall. The BCA Board is a nine person body with two-year electable terms. Terms are staggered, so each year half the positions are open for election. All persons who live, work or have a special interest in Buckman are welcome to become part of the Association and to serve on our Board. Next month, we will hold elections for four 2-year and one 1-year terms. Please consider serving your neighborhood and running for the Board! We welcome new volunteers! The election will be 7-9pm, Thursday June 14th in the Central Catholic High School library. Refreshments will be available! A quick note about the BCA’s monthly meetings: because we lose access to Central Catholic High School during the summer months, our July and August meetings will be held in the Multnomah County Board Room, located at 501 SE Hawthorne Blvd. The dates of those meetings are July 12th and August 9th (both Thursdays). Starting in September, we’ll return to our usual location in the library at Central Catholic. The Portland Housing Bureau is proposing new areas to receive incentives that would expand a program that gives private developers 10 years free of taxes when they build new market rate apartment structures as long as they include some affordable housing. The new areas include significant portions of Belmont and Morrison Streets in Buckman. You can see the map here. This is a link to a page on the Portland Housing Bureau’s website with more information on the tax incentive policy: http://www.portlandonline.com/phb/index.cfm?c=57699. Update: We’ve received an info sheet with more details on the PHB policy. Opportunities abound for you to get involved in the BCA, in a variety of ways! Read on for more details. Planning is underway for the next paper edition of our newsletter, which, like this blog, is called the Buckman Voice. We’re currently soliciting articles on any topic you think would be of interest to your neighbors. They don’t have to be long; even just a few paragraphs is fine. Examples include: a group or organization you’d like to publicize, a new local business that you think people should know about, a neighborhood cause you’d like to stump for, etc. To pitch us your idea, simply send an e-mail to buckmanboard@googlegroups.com. Articles are due by Thursday, March 8th. You can download PDF versions of past issues of the Buckman Voice from our website: http://www.buckmanpdx.org/newsletter. Because we hand-deliver copies of the Buckman Voice to every home in the neighborhood, we’re also always on the lookout for volunteers willing to help with the delivery. It’s a great excuse to get out for a stroll and perhaps meet some new neighbors. Volunteers are encouraged to e-mail us at buckmanboard@googlegroups.com. We’re in the midst of election season, and the BCA is getting in on the action by hosting candidate forums at our next two monthly meetings. At our March meeting, which will be held on Thursday March 8th, we’ll be inviting the candidates for the two City Council seats to come and take questions from our members. At our April meeting, on Thursday April 12th, we’ll be doing the same with the candidates for mayor. Of course, you’re encouraged to attend both meetings in person, where you can ask questions of the candidates, but if you can’t make it for any reason, you can also submit questions to us via e-mail at buckmanboard@googlegroups.com. You can also feel free to post questions on our Facebook page at http://www.facebook.com/groups/50481109906. We’re 6 months away from our third annual Summer Picnic in the Park, to be held on Sunday, August 5th. We’re looking for volunteers to help with the picnic planning and organizing process. It’s a fun and easy way to get involved in your neighborhood by helping to put on this great event. Interested parties are welcome to e-mail us at buckmanboard@googlegroups.com. Finding a consistent meeting spot for the Buckman Community Association has been a bit of a bugaboo the last year or two, so we apologize for any confusion and/or inconvenience this has caused you. Our goal is always to maintain stability in our meeting locations, to make it easier for people to participate. As is always the case, meetings are on the second Thursday of every month. The BCA board meets from 6-7pm, followed by the general meeting from 7-9pm. Buckman Voice: Deadline for next issue? Content for next issue? Just a quick update to let you know that September’s Buckman Community Association general meeting will take place this Thursday, September 8th, in the River’s East Building, located at 1515 SE Water Avenue. The meeting will be held from 6-8pm in the Mt. Adams Room, which is located on the 3rd floor. There is free parking available in the building’s parking lot. The BCA meeting for October is also currently scheduled to be held in the Mt. Adams room, on October 13th at 6pm. Tonight is the monthly Buckman Community Association general meeting. This will be a special meeting, as we’ll be turning over the bulk of the agenda to the Buckman Historic Designation Committee to talk about their effort to establish a National Register Historic District in the oldest part of Buckman. There will be time for questions from the audience. The meeting with take place from 7-9pm at Central Catholic High School, located at 2401 SE Stark St. We normally meet in the library at Central Catholic, but due to the size of the planned event, we will be meeting in the cafeteria. The BCA Board will meet prior to the main meeting, in the main floor conference room at 6pm. In the spirit of community-building, collaboration and FUN, SE Uplift is offering to facilitate a coalition soap box team to enter in the annual August PDX Adult Soap Box Derby at Mt. Tabor Park. On Monday, January 31st, SE Uplift will host a meeting to explore the feasibility of a SE Uplift Soap Box Derby Team. We need, at minimum, 10 volunteers to commit to involvement between March and August. Expectations and roles will be decided on as a team. SE Uplift will serve as a teammate, organizer and facilitator, as needed – but individual teammate commitment, reliability, and follow-through will determine the fate of the SE Uplift Soap Box Derby team. Other than planning and building meetings (scheduled by the team), teammates will participate in the mid-April registration process, as well as the actual Soap Box Derby itself in mid-August. If you are unable to attend this meeting but you are interested in participating on the team, please email soapbox(at)southeastuplift(dot)org. For details on the 2010 Derby, view the Racer Packet here. We look forward to creating, building, toasting and laughing with you! Environmental Services has designed a series of sewer improvements and stormwater management projects in an area of southeast and northeast Portland known as the Oak Basin (see project area map below). The work will alleviate basement flooding problems, and replace more than 8,000 feet of sewer pipes that are in poor condition. Some sewers in the area are more than 80 years old. The upgrades will increase sewer system capacity, improve reliability and help control combined sewer overflows (CSOs) to the Willamette River. The work was originally scheduled to start in the summer of 2008, but has now been delayed to spring 2009. The project will take about 18 months to complete. The original project included replacing or refurbishing the existing sewer pipe in SE Oak between 18th and 10th. This included work on Buckman School grounds and at St Francis Parish. That work has now been pulled from this project and will be rescheduled later. Included in the future project will be additional Green Street facilities in an area east of the School. 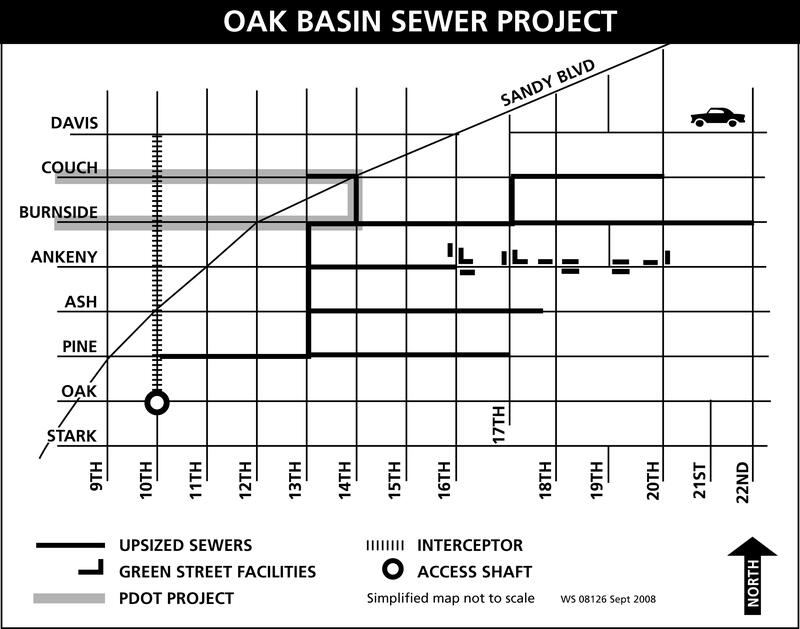 The Oak Basin Sewer Project will require both open-cut trench construction and trenchless techniques to rehabilitate existing sewers. The project also includes construction of a new large interceptor sewer line in SE 10th Avenue and an access shaft at 10th and SE Oak Street to connect the new line to the sewer system. Construction will affect traffic with both travel lane and street closures. The city will provide traffic control updates during all phases of construction. The Oak Basin Sewer Project includes construction of several Green Street facilities along SE Ankeny Street between SE 16th and 20th avenues. Green Streets are vegetated curb extensions or streetside planters that collect stormwater runoff from the street and keep it from flowing into the combined sewer system. Green Streets slow stormwater flow and allow water to soak into the ground as soil and vegetation filter pollutants. This sustainable stormwater management technique treats stormwater at the site, protects water quality and helps replenish groundwater supplies. The City of Portland Office of Transportation (PDOT) is designing roadway improvements for the Lower East Burnside and Couch Reconfiguration Project. Environmental Services is coordinating with PDOT to complete sewer construction in the PDOT project area before road construction begins. Call David Allred at 503-823-7287 for additional information or to arrange a presentation for your organization or business. To receive email updates, send your email address to david.allred@bes.ci.portland.or.us. Learn more about the Environmental Services Sustainable Stormwater Program at www.portlandonline.com/sustainablestormwater. David will also be giving a presentation and be available to answer your questions at the November 13th general meeting at Buckman School. City Council candidate Amanda Fritz is coming to speak and hear Portland’s neighborhood concerns Monday, October 13th at the monthly meeting of the Buckman Historic Association. Come hear her at 7 pm and then stay to find out more about the Association. The Buckman Historic Association is forming a cross-neighborhood coalition to address development policies in support of sustainable neighborhood growth, preservation of existing historic neighborhood character and livability, creation of walkable and green neighborhoods, compensation of increased density with neighborhood amenities, enforcement of development policies, and more. The meeting will be held at Hinson Memorial Baptist Church, SE 20th & Salmon St. Male youth offenders currently housed in Tigard will be moved into the Janus property at 16th and Morrison for approximately 4 months while their Tigard facility is being remodeled. Persons with questions and concerns should contact Janus Youth at 503-233-6090 and attend the October 9th BCA Meeting where the Executive Director, Dennis Morrow of Janus will be there to answer your questions. The Portland Planning Bureau is working on a project to look at non-conforming commercial uses along Hawthorne Boulevard to consider changing the zoning to Storefront Commercial (CS), consistent with the current building uses and the commercial zoning along other parts of Hawthorne Boulevard. 18 properties between SE 15th and 34th Avenue have been identified that have existing commercial uses with multi-dwelling (R1) residential zoning. These uses are non-conforming, which can make it difficult for property owners to expand existing businesses and prohibits new businesses from being created in new developments. The Planning Bureau has initiated a study to consider changing the Comprehensive Plan Map and zoning to bring the zoning into conformance with the commercial uses. One of the key factors is determining if the zone change will have any significant adverse impacts to the transportation system. Although the CS zone has the same maximum building height (45 feet), it can enable larger mixed-use buildings with more units than the R1 zone. Therefore, this study will include a traffic impact analysis to determine the potential impact to the signalized intersections along Hawthorne Boulevard. Tom Armstrong from the Planning Bureau will be at the October 9th general meeting to discuss this study. Once the traffic impact analysis is completed, there will be a community meeting in late October or early November to discuss the findings and decide whether or not to proceed with the proposed zone changes. For more information, contact Tom Armstrong, Planning Bureau, 503-823-9140 or tom.armstrong@ci.portland.or.us. The BCA has some distinct questions and concerns about these proposed changes that go beyond the City’s interest in creating a more dense urban landscape and the Hawthorne property owners desire to redevelop their lots. Any new development under these changes could not only increase traffic but would also triple at least the density of the properties and there is be no required parking called for in the plan as Hawthorne is a transportation street. For those Buckman residents on Hawthorne, Madison and Main, this proposal may have some significant impacts both positive and negative. We will discuss this proposal at the upcoming BCA land use meeting on Sept. 25th in preparation to the City’s presentation in October.